ĐỒNG THÁP – A new bridge officially opened to traffic in Phú Thuận A Commune, Hồng Ngự District, in the Mekong Delta province of Đồng Tháp after six months of trial use. 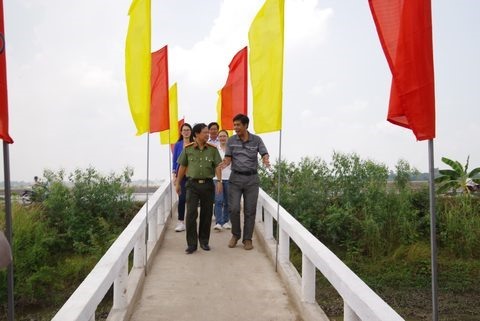 The bridge was built under a project to prevent and mitigate natural disasters run by Công An Thành Phố Hồ Chí Minh (HCM City Police) newspaper with funding from BAT Vietnam since 2013. Its main aims include building rural bridges in the Mekong Delta, especially in cities and provinces where people’s lives are still very difficult and education is limited. The bridge, with a length of 30 metres and width of 1.6 metres, cost VNĐ180 million to build. These rural bridge projects are part of a global CSR programme that BAT has implemented over the years to support public works in difficult localities.